Monkey and Squidge: Just like mum made! …I've got petals ready to make into flowers… thanks pop for cutting them up. Not really sure why I said that because he never reads this, still credit where credits due. 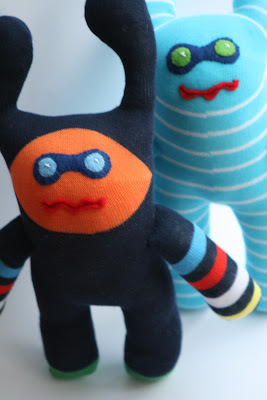 …and I really want to make a little drawstring bag, or maybe a few! Thats why I feel restless. I've got so much to do, or at least so much I want to do, and that's why today I did none of these things. Instead I stumbled upon an old pattern my mum had drawn of a frog. It's strange how a little piece of card can fill you with emotions but this little piece of card did just that. I remembered as a child having one of these little frogs, or probably several if I was anything like my kids are, filled with beans and I vaguely remember it being made of cord. I know my mum made lots of them for our school too. No health and safety in site then, just a homemade toy filled with beans! …today mine are filled with rice… tomorrow mung beans! Apparently a good filling for bean bags!!! The ones mum made were fairly big… mine are tiny, and I think I had eyes on mine but these ones are just plain. It took me a little while to get mums pattern to the right size (the size of the red one), but I love this little one. She fits in my hand and is very tactile. Think I may keep her as a stress relief… not that I'm ever stressed… Ahem! So now for my health and safety slogan… not suitable for children under the age of 3! 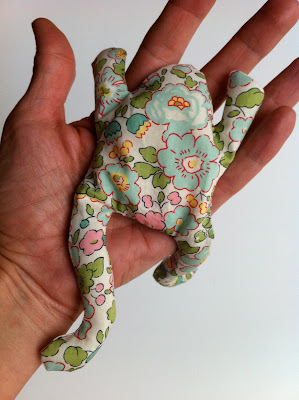 So with frog in hand being squeezed rather tightly… shall I do another craft fair? Sorry little frog, I hope I haven't hurt you… stressed? Me? Never! Thanks for looking, comments always welcome! Yes, yes… that's just like me always flitting. Thank you for the kind comment, still not 100% about the fair yet though.